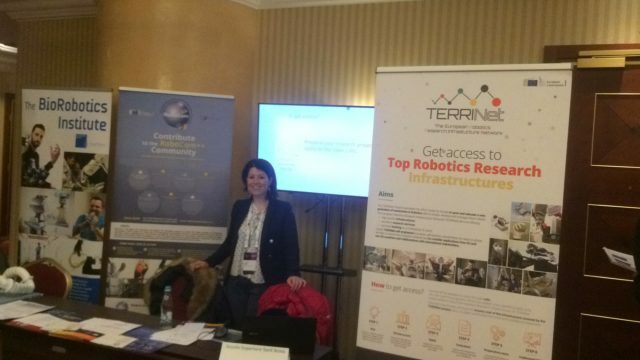 During this event was hosted, among the Networking Programme, the parallel session “Science-grounded Robotics: the TERRINet and RoboCom++ European Projects“. The synergistic and virtuous interaction of the two European projects FLAG-ERA RoboCom++ and TERRINet aims at exploring the grand challenges of sciencegrounded Robotics and offering the top quality infrastructures and excellent research services in order to set up the frame of a Future FET Flagship initiative on Robotics. RoboCom++ Project is gathering the community and organising the knowledge necessary to rethink the design principles and fabrication technologies of future robots, by fostering a deeply multidisciplinary, transnational and federated effort. TERRINet Project is committed to grow and educate a new generation of researchers in Robotics able to design and manage future robots. to present the Working Groups of the RoboCom++ Community. The networking session was divided into two parts: after a first speech corners in which the two projects and relative opportunities briefly were presented to the audience, two brainstorming sessions run in parallel in a more dynamic and interactive way.